What Exactly are These Phone and Tech Companies Agreeing on Exactly? Android 7.0 (Nougat), Google's most recently released Android operating system includes a toggle called "Blue Light Filter." Many Samsung Galaxy S7 owners (and owners of other Android phones) have recently received the update to this version, however even in some of Samsung's other recently released smartphones before Nougat they included a "Blue Light Filter" feature. Clearly Samsung and Google both think this is an important feature. Apple, on their side, have included for about the last year a feature called "Night Shift" that is intended to reduce the amount of Blue Light emitted by an iPhone, and specifically have the ability to turn this on automatically at a certain time in the evening (after dark) until morning. The idea being that the blue light emitted from phones at night is negatively impacting sleep rhythms. Very recently, Apple has started including it in their MacOS operating system for full-size computers as well. Why is Everyone So Blue on Blue Light? Most people are aware that Ultraviolet (UV) Light can cause damage to our skin and eyes. Fortunately, the most damaging UV Light, UVC, is a non-issue for us because of the protection provided by the Ozone Layer in our Atmosphere, but UVA and more importantly UVB still can cause harm over the course of our lives. For our eyes, UV light is a main culprit responsible for cataract formation and damage to the front of our eyes. Blue Light (the light in the spectrum just below the energy levels of UV), on the other hand, damages the back of the eye; damage to this part of the eye can be linked to Age-Related Macular Degeneration (AMD). This condition leads to loss of central vision, and can have great effects on quality of life. Fortunately, not all blue light is bad. The blue-turquoise light range, which is from 465 nm to 495 nm, is essential to our vision, the function of our pupillary reflex, and in general to human health. It also helps to regulate our Circadian sleep/wake cycle . 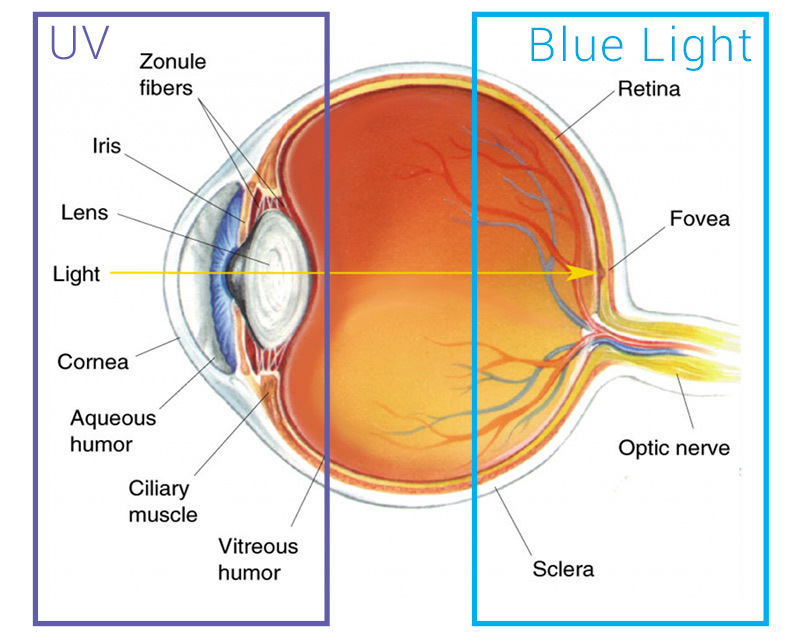 So blue light in general can have positive affects on vision as well as the body. Inadequate light exposure means inadequate blue-turquoise light, which can throw off our Circadian biological clock and our sleep/wake cycle. However, as are the claims of device-makers, this type of blue light if viewed at the wrong time may negatively affect our ability to sleep. Whether this alone is the cause of sleeplessness is still up for debate, and applying their "blue light filters" may help, but there are still other blue light sources to be considered as well. But it's at least a nice effort on their part! Wait, Why Is It More of a Problem Now? Well, unfortunately for our eyes, there's a high chance that most of the lighting we encounter daily are Compact Flourecent Lights (CFLs) or LEDs, because of their energy-saving qualities. However these emit high levels of blue light. CFLs contain about 25% of harmful blue light and LEDs contain about 35% of harmful blue light . Interesting tidbit: the cooler the color-temperature the higher the blue-light proportion, so the "warm white LED bulbs" may have more advantages than just "feeling more cozy!" By 2020, 90% of all of our light sources are estimated to be LED lighting . So our exposure to blue light is only going to increase in coming years. As baby boomers age, there's an increasing incidence of cataract and macular degeneration cases in the United States. In 2012, there were approximately 24 million cases of cataracts in people aged 40+ the United States,6 which is a 19% increase from 2000 numbers. For macular degeneration, two million people aged 50+ had late AMD in 2012,6 which is a 25% increase from 2000. By the year 2050, the cataract population is going to hit 50 million, whereas AMD tops off at around 5 million, it's estimated.7 So the bottom line is that cataract and AMD cases are expected to double over the next 30 years, in part because of the aging of the population. So We're All Doomed? Thankfully, Not Quite. Pretty depressing, huh? Fortunately, there's a lot of active research going into this area, and there are already some steps that can be taken. For starters, you can try out some of the blue light filters provided by the likes of Google, Apple, and Samsung. Turning these on, you will notice a slightly warmer hue to the colors, especially white areas will appear more "yellowish." The effectiveness of these software-provided blue light filters may or may not provide enough protection, but it's an easy way to start. Keep in mind, you may just want to turn off these features temporarily if you have a need for "accurate color representation" (Photo Editing, Graphic Design, etc.). However, this ignores many of the other light sources, most of which don't have software controls (at least for now!). This is where blue light blocking lenses in your glasses can come into play! We sell these lenses here at ModernEyes, because we want to do our part to provide you the opportunity to protect your eyes. In fact, I personally don't need corrective lenses, however I do have a pair of glasses that I wear, especially on the computer, that has a set of lenses that block blue light. The effects to the colors I see while wearing them are very similar to the blue-light filters on phones. And the lenses don't make you "look goofy" either. The appearance difference between "standard" clear lenses and the blue-blocking ones is very subtle; if you look carefully for it you will notice slightly purple or blue colored reflections at limited angles. That's all! For those of you "lucky" enough to require a glasses prescription, the transition to using blue-blocking lenses will be an easy one, because you're already used to wearing glasses! For others, like me, you may have to get used to it a bit. Fortunately here at ModernEyes we have a lot of really cool looking glasses frames to choose from, so you now have the opportunity to "keep up" with your friends who have super sweet glasses. So ask your Eye Doctor or Optician about these lenses, your 90-year-old-self will appreciate it!